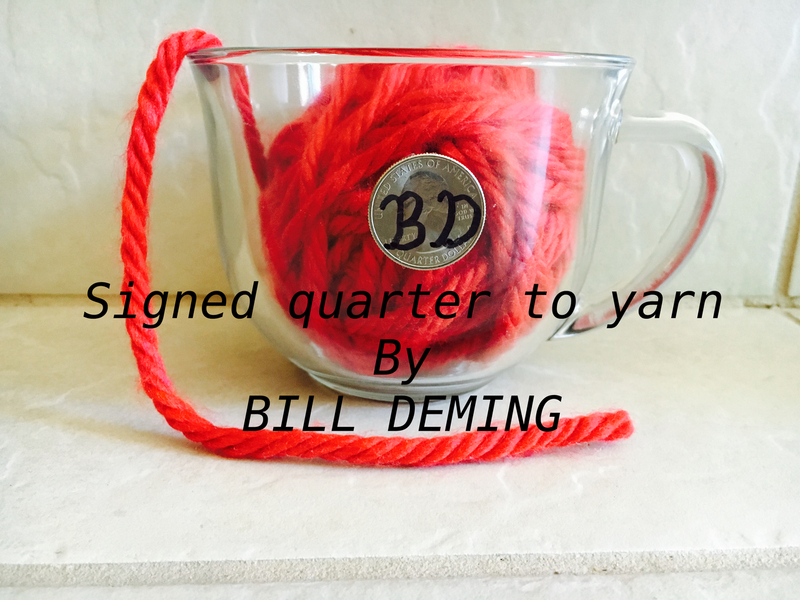 Today, when you order "Signed Quarter to Yarn By Bill Deming", you'll instantly be emailed a Penguin Magic gift certificate. You can spend it on anything you like at Penguin, just like cash. Just complete your order as normal, and within seconds you'll get an email with your gift certificate. Imagine this: You borrow a quarter from a spectator and have them initial it. You then grab a black cloth, clearly put their quarter under the cloth and give it to them to hold. You then pull away the cloth and the coin has disappeared into thin air! But wait! 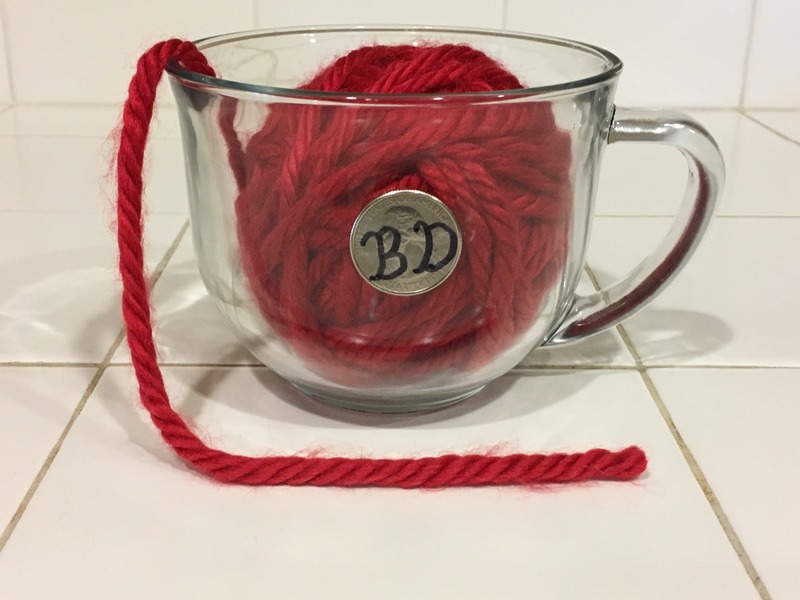 That's not all... You reach into your bag and pull out a clear glass with a big ball of yarn in it. Hand the ball of yarn to the spectator, and without ever touching it again, instruct them to pull the yarn until it's completely unraveled revealing an Altoids box with rubber bands all around it. With growing anticipation, the spectators open the Altoids container and to their astonishment inside rests their signed quarter! I simply love it. Easy to do, great explanation. I am very glad with this. It is a worker. You will amaze your audiences. Some of us older magicians remember when the quality of props and gimmicks were much higher than they are today. The handcrafted hidden gimmick for this effect outshines even the days of old. Much care, thought and attention to detail is invested in each hand-made gimmick. Another great take-away is increased entertainment value by involving a larger number of audience members, rather than just for those who are close by, or the one audience member removing a dollar bill from a lemon. The fun audience involvement for this retro effect is outstanding. Well done, and done well. This is a great and modern update on signed quarter to impossible location. I did this as part of a stand-up set for over 100 people and it played very well. Out of all my effects that night, everyone commented on this one and had no idea how it was done. It can be staged to include several people and plays really big. I have also done it while table hopping and it is very strong. I highly recommend this--easy to do and gets great reactions. The video teaching is clear and includes lots of performance ideas. This is one of the best effects I have bought in a long time. Old trick new idea, love it, had to modify it to more like the old effect but worked great in my last show. Yes we all know how it's done and because of that our initial reaction is "that old thing again," but once we get over that initial reaction, it's easy to see why this is such a classic and why we loved it as kids. Slightly snazzier version of the old coin in matchbox we all had as kids but made bigger and more visual with Bill's version. He includes everything you need which is a great touch. Good to see this often forgotten classic resurface. This is such a great effect -- with virtually no moves to speak of, you vanish a SIGNED quarter and it appears in an Altoids tin, wrapped in rubber bands, wrapped in 60 feet of yarn. From the moment you introduce the nested items, you never touch them again. Your spectators unravel and open everything as cleanly as possible, because you're literally not doing anything. You get Bill's awesome handmade gimmick and the perfect silk. But he also gives you the yarn, the Altoids tin, the rubber bands, and even the paper shopping bag! They're not even gimmicked, and you can get them all for less than $10 in a single trip to Target. But not having to make that trip is worth even more, and Bill picked out the perfect sizes and colors for everything. I'm sure he would have included the glass if it wouldn't have doubled the shipping cost, but it's also ungimmicked and can be found at the dollar store. As for the quarter and Sharpie, you're on your own. The only downside I can think to mention is that this effect is not ideal for restaurant work, since you have to legitimately wrap 60 feet of yarn around the Altoids tin. It doesn't take more than 30 seconds, but it's a little conspicuous. For anyone else -- stage, parlor, close-up, or strolling with a little distance between performances -- this is a winner. 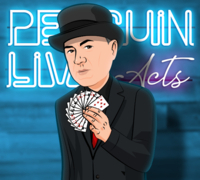 Bill is a working magician who seems to be too busy performing to market this great effect. That's too bad, because he deserves a lot of credit for a stunning trick at a tremendous value. 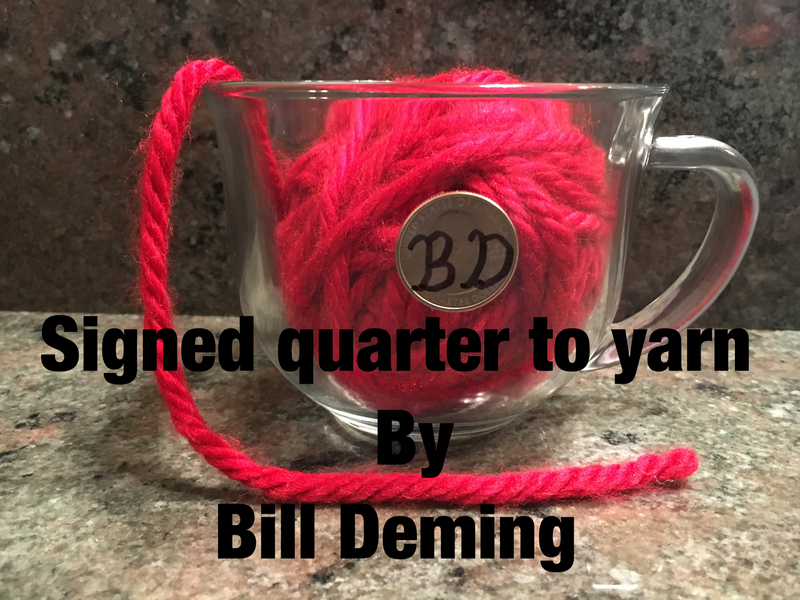 I purchased Signed Quarter to Yarn last summer after meeting Bill while the two of us were performing at the California State Fair along with a few other magicians. He performed this trick for us and I knew right then and there I had to buy it. I am so glad I did as this a beautiful piece of magic on many different levels. This slays audiences every time I perform it. This is very easy to perform leaving you with lots of latitude to focus on the showmanship. My favorite aspect of this is the fact that you can get the audience directly involved in the magic as you thread the yarn through their fingers. You can feel the tension building to a climax. When they find their signed quarter in that altoids box their reaction is positively explosive! I love it! Bill, great gimmick! This is one trick that I feel like I got my money worth! Also, very nice to meet you in Avery, CA. Hope to see you again .